The United Korean pair of JANG Woojin and CHA Hyo Sim has overcome all odds to be crown Mixed Doubles Champions at the Seamaster 2018 ITTF World Tour Shinhan Korea Open. They beat the Chinese pair of WANG Chuqin and SUN Yingsha 3-1 to claim the gold. The reunification of the Korean teams came as part of the ITTF Foundation’s Ping Pong Diplomacy programme to support solidarity through table tennis. Backed by over 6000 fans packed in the Chungmu gymnasium, the players were cheered on by the boisterous crowd celebrating every point won. WANG and SUN took the early lead in commanding fashion, winning 11-5 in the first game. However, the nervous atmosphere was quickly diffused as JANG and CHA rallied back to win the next two. With the crowd at the edge of their seats, both teams were neck and neck in the crucial fourth game. Holding match point at 10-8, JANG and CHA were pushed back from the table by some aggressive play and made to defend. Their patience paid off when a sweeping forehand shot from the Champions elect forced WANG into an error, bringing an end to the match with the final score 3-1 (5-11, 11-3, 11-4, 11-8) to the United Korea pair. 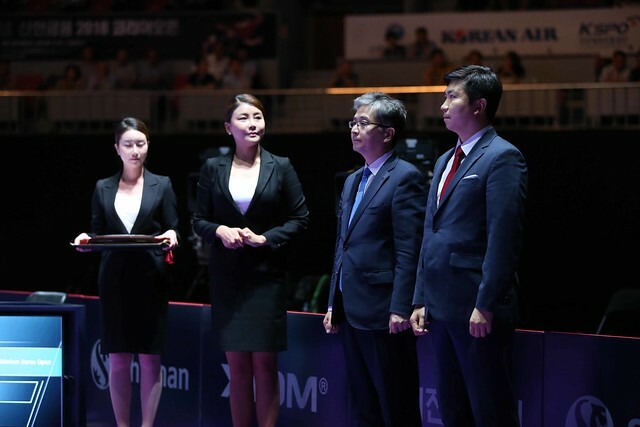 With the crowd cheering nonstop at this historical win, JANG and CHA were crowned Seamaster 2018 ITTF World Tour Shinhan Korea Open Mixed Doubles Champions. They are the third Mixed Doubles winners since the event debuted in China. The Mixed Doubles event will feature in the 2020 Tokyo Olympics. Semi-finals action for the Shinhan Korea Open continues today, 21 July, with spots for the Women’s and Men’s Singles finals still up for grabs. In the Men’s doubles event, HO Kwan Kit & WONG Chun Ting face off with JANG Woojin & LIM Jonghoon while WANG Manyu & ZHU Yuling take on compatriots CHEN Meng & DING Ning in the Women’s doubles final. All four finals will be contested on Sunday, 22 July. The Seamaster 2018 ITTF World Tour Platinum Shinhan Korea Open is the fourth of six Platinum events on the ITTF World Tour, which is the top tier of the ITTF World Tour with the most prize money and world ranking points. Together with the six regular ITTF World Tour events, players compete to earn World Tour Standings points qualify for the singles, doubles and mixed doubles events at the one-million-dollar World Tour Grand Finals in December.